LMNTRIX was founded by Carlo Minassian, a cybersecurity entrepreneur with over twenty years in the industry. Carlo pioneered MSSP in Australia after seeing a need in the market that few did. He left a secure future with IBM to start a business in his bedroom. He and his team were so far ahead of the curve they struggled at first. Thirteen years later this company, earthwave, had become a Gartner magic quadrant leader and was sold to Dimension Data. Carlo embarked on the journey to globalize the service he had created. At LMNTRIX, we think like the attacker and prize detection and response. When we hunt on your network and your systems, you cease to be the prey. We turn the tables on the attackers, shifting the cost to them and changing the economics of cyber defence. We strategically weave illusion into your entire network, coating every endpoint, server and network component with deceptions, creating an environment naturally hostile to a hacker. When attackers are unable to determine what data is real and what is not, their ability to make decisions vanishes and their attack is paralyzed. We call this Adaptive Threat Response (ATR). 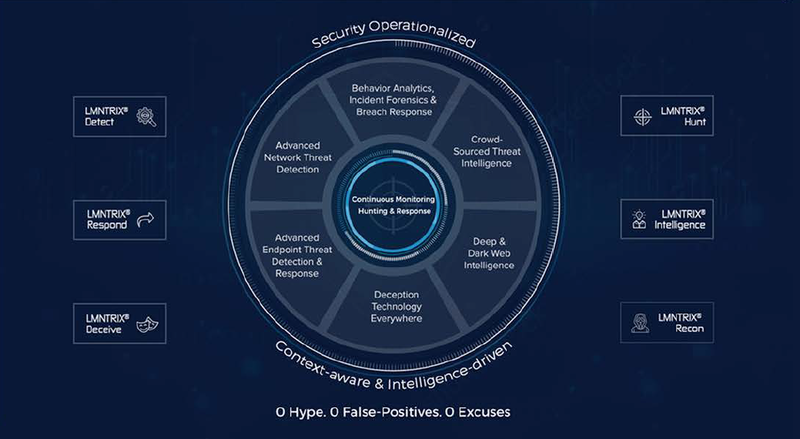 Adaptive Threat Response is a validated and integrated threat detection and response architecture that addresses unknown and advanced threats that slip by perimeter controls. Our methods are unique and powerful, combining advanced network and endpoint threat detection, deceptions everywhere, analytics and global threat intelligence technology. Wrapped around this technology is continuous monitoring that can be further strengthened by best-in-class threat hunting that is both internal and outward facing, capable of scouring the deep and dark web. In short, the LMNTRIX Adaptive Threat Response is a fully managed, security analyst delivered service. 24 hours a day. 7 days a week, it defends you.